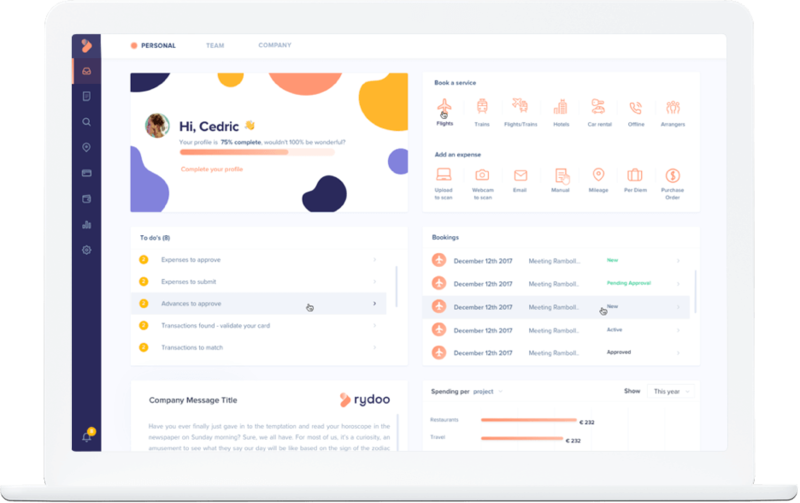 Here at Rydoo, we’ve created an intuitive and paperless platform to make it easier for those in the automotive industry to keep track of their company expenses. Our system is fully automated and integrates your existing hierarchies, company policies and financial systems, for a smooth and seamless process that can save you up to 75% of time spent on joyless administrative tasks. Employees need to travel for work? No problem Rydoo Travel makes it easy for employees to book flights and hotels, we have a huge directory with over 800,000 accommodation choices, and all bookings will be immediately processed via our systems and sent to the relevant people for approval. At the end of the month, we bundle everything, travel and expenses, and send it across to the finance department in one neat and tidy package. Rydoo makes things simple. Get in touch for more information or see for yourself with our 14-day free trial. With the integration of Google Maps, calculating mileage costs is more intuitive than ever. Fill in the details of your car journey and we’ll generate the required reimbursement. Once an expense has been approved by the travel manager, an additional step in the approval process can be added for the finance department – the control mode. This not only helps to make sure all members of the team involved in processing invoices are kept in the loop, but that all expenses are within company policy, good to be reimbursed and ready to be sent to your accounting software. Are you finding that less and less of your time is spent at your desk and more often than not you’re in meetings or simply on the go? If this sounds like you, don’t worry! You can access and manage your pending approvals while watching a PowerPoint presentation or making your way across town. With the Rydoo mobile app you can view, approve or reject your team's expenses with a few quick swipes. Export your reports in a variety of formats including Excel, XML, CSV or PDF. You Rydoo wherever your business travels. Let’s you get down to business . From coffee receipts to business trips to NY, get the best possible experience by integrating Rydoo travel & expense. One platform to manage it all - Seamless flow, better insights, better control. For a long time we processed the expenses manually. With this app you only have to take a picture of your receipts. You can submit your expenses in only a couple of minutes time. Our employees appreciate that very much. They don't need to keep all their receipts and they can count on a faster process and faster reimbursements of their expenses.